Tremors (smaller, evident when person is writing). Larger, more apparent tremors, typically involving an arm and a leg while they are at rest. Pain in the back, neck, shoulders, temple or chest. Bradykinesia – a slower pace of walking and less expressive facial expressions. Speech change (tone, inflection) – due to rigidity of chest muscles. Less blinking leading to dry eyes. Gait abnormalities – patients no longer walk in normal manner. Keep eye drops on hand. Find ways to stimulate the patient intellectually. Keep him or her involved with friends and family. Encourage them to participate in activities that they enjoy for as long as possible. Work with them to find new hobbies. Be patient with doing things at a slower pace. Don’t try to rush the person. Create a routine so as to make it easier for the person to remember day to day activities. 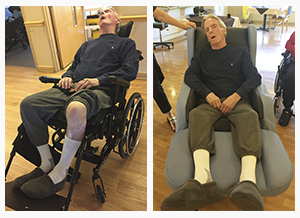 Click here to here Martina’s tips when seating patients with complex needs.